visible in the left foreground. This two-element vertical array was switched with your solid, easy-to-connect Array Solutions phasing box. During the contest, one operator commented, "I was on Europe, and heard some JAs in the background. Switching directions, I brought them up to a workable level." P.S. I really like my 40m pair at home -- although I have your original gray control box instead of the snappy new blue one. TU! I can send you a report on the set up at Little Cayman, but the quick summary is that all our antennas were verticals or wires, and we set up Field Day style. The WX0B box was on two Force 12 40 meter verticals, a 1/4 wave apart, oriented a bit north of east [EU and AF from our QTH] and the other end a bit west of south [PAC and AS direction]. We used two 43' long pieces of 8X to each antenna, with the feed line [also 8x] and the controller cable back to the shack, about 90' distance. The Force 12 verticals were ground mounted and guyed. I fed them with my favorite "system," a Budwig dipole center connector! We used the W2DU baluns on each vertical. Initially, I had two radials, each elevated at 8' or so, and about 36' long. We finally ended up with one elevated radial on each vertical, about 33' - 4" long. We used the MFJ SWR analyzer for our testing. Double checked the control cable connections, as per your instruction sheet, and zap! ON the air. It just worked great. 40 was our second best band, and both before and after the test, we made a lot of JA's, and others in AS and PAC, vy happy with an all time new one. 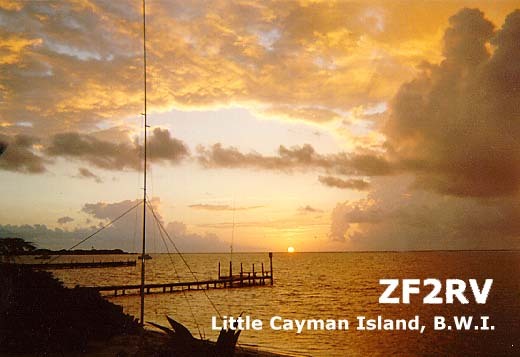 Finally, our QSL card will show the sun rise, with palm trees to the side, and one of the 40 meter verticals and the HF6V in the middle. Can send you a copy of the photo if like. Well, I did say short, but there you are. If want more, let me know.